OK result for green smoothie. Very good result for crushing ice using the pulverising blade. Very good for frozen fruit smoothie. All parts dishwasher safe except blade assembly. Poor result for blending kale. 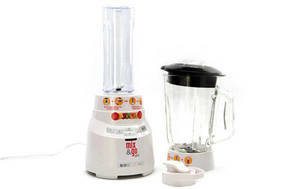 Can be difficult to remove blade assembly from blender jug as it becomes tighter after processing. There's limited grip on the blade assembly, making it difficult to remove for people with weak wrists and fingers. No suction feet and top heavy so can be knocked over. Food can become jammed at the top during processing and needs to be manipulated. We tested performance by making a green smoothie and frozen fruit smoothie – as well as blending kale and crushing ice. Our green smoothie was made with cucumber, celery, kiwifruit, pear, spinach, mint and water. Ease of use was based on how small you had to cut the food before putting it in the cups, how easy it was to pour and drink from the cup, and whether it was easy to travel with the cup. We also looked at assembling and disassembling the parts, how easy the controls were to use and how easy it was to clean. We also measured the noise on the highest setting. This does not contribute to the overall score.